We count on our furniture like we do our good friends. Good friends and furniture should be genuine, reliable, and enhance our lives. By middle age I’ve removed all my toxic friends and still learning that true beauty is from within. But in the case of furniture, how can we tell if it’s as beautiful inside, as it is on the outside? Treasures untold, good and bad, may be inside your couch. What do these trinkets tell us about this couch's previous owner? In a world of mass manufactured goods, attractive branding usually does not rely on the product’s factual description to sell it. Big brand stores like Target and Ikea offer great design to the masses, but I cannot ignore the facts of their offerings: mass manufactured overseas, not environmentally savvy, and potentially toxic. Transportation is one of the major reasons we burn fossil fuels, and contributes 35% of all fossil fuel emissions. I learned this key information in the Green Leader Training from the Sustainable Furnishings Council. Imported goods then represent two negative marks on the environment. In my first career of import garment manufacturing, it was common knowledge that our federal government requires testing for lead and phthalates in children's clothing. It still seems weird there is no mandate for adults even today. Technical Bulletin 117-2013 no longer requires neuro toxic flame retardants in our furniture foam, but is still rather new to California. 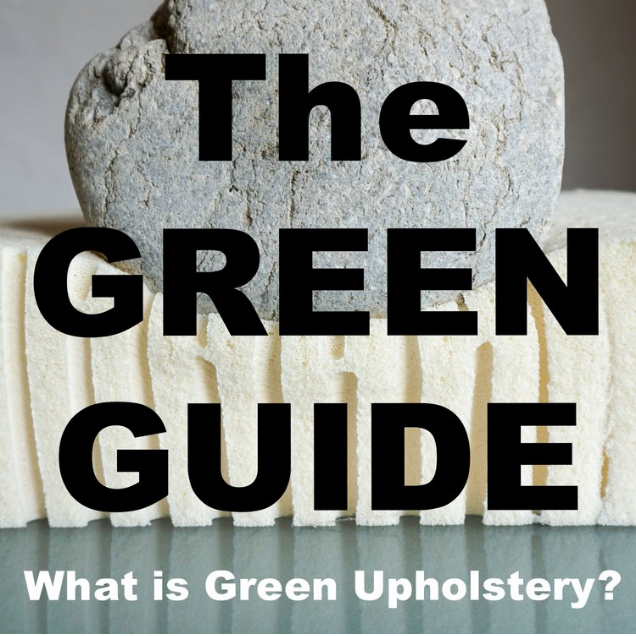 You can find more information about furniture foam on Non-Petroleum page. Understanding the truth of a product, the facts of it’s quality and sources may change your mind of allowing toxins into your home. Similarly, you may be getting more than just aesthetics and a low price when purchasing mass manufactured furniture. Like many owning their first home, I didn’t have the money to purchase the gorgeous furniture I yearned for [insert drool and daydreaming]. Instead, I purchased old pieces and had them reupholstered. How proud was I to gaze upon my living room, a mid-century couch and a pair of walnut conversation chairs that were better than imagined. And my favorite, a metal accent chair fashioned with a black velveteen fabric that worked in every room. It was a dream come true. Old foam is orange and crumbly from use and sun exposure and are the transporters of PBDEs, neurotoxins, into your home. What's hidden under that dust cover? OMG!!!!!!! That's what I've been sitting on this whole time???? Seven years later during an upholstery class, would I find the awful truth while restoring the seat of my favorite metal accent chair. In this first project, I was so happy to finally remove hundreds of staples, old foam and fabric. Unexpectedly, a stink of urine wafted from the seat’s foam— which was actually recycled carpet padding. A common practice for ‘chop shop’ upholstery that’s cheap and looks good. This old foam leeched it’s unpleasant surprise into the wood seat base which was also a loss. Shocked and dismayed, I now wondered what else was hiding in all my other furniture. And thus began this journey into custom upholstery and using non-petroleum materials. I trusted someone to reupholster my furniture and I was dazzled by the cheap prices, and oblivious to the sour truths covered in stylish fabric. I later found old foam in my mid-century couch, and strengthened the flimsy construction once I restored it myself. Finding the facts and knowing the truth about what’s inside furniture has changed my life. We all can no longer risk our health if our furniture is not really as it seems. Click through to custom order your own 'Ghost of Satao' chair.